OK, so you bought a spa to relax, reduce stress, relieve tension and to get away from the fast-paced world around you. You've used it a couple times, and have found that it really is all those things and more. As a matter of fact, you don't know how you lived without it. It's great! But it is on this occasion when you lift the cover to get in, that it is no longer the sparkling clear water you are used to, but a cloudy and smelly mess. What happened? The pump and filter seem to be working, the water is warm, and except for the way it looks and smells, everything seems to be OK. You find the owners manual and notice it recommends that you test your water. You see words and numbers like PPM (parts per million), sanitizers, total alkalinity, pH, and something about the possibility of the water being hard. This stuff would scare anybody. You panic! You don't know what to do. So, you get the picture. Although this is a typical scenario, water chemistry doesn't have to be scary or difficult to understand. The first thing that you need know is that your spa is not a tiny pool. Spa water - its treatment and parameters - is much different than a swimming pool . The main difference of course, is the temperature - spa water is most often set between 102 and 104 degrees Fahrenheit, while a pool stands typically at 82 degrees, which also means that there's far more opportunity for bacteria growth in a spa. Plus hot water opens pores, making bathers much more susceptible to skin infections. When not properly cared for, spa water can be responsible for common ailments like rashes and urinary tract infections. It can also cause cloudy water and damage the spa surface and equipment. The previous paragraph was not intended to scare you, but to educate and stress the importance of testing the water and keeping it balanced. So, to help you get a handle on what water balance means, and how you can maintain it, let's look, one at a time, at the factors that shape your water quality. As you know things such as bacteria and viruses like to grow in any kind of water especially hot water. Sanitizers are used to effectively disinfect and keep water smelling fresh. The two most popular ones are chlorine and bromine. You can test these by using a test kit or test strips. Proper reading for chlorine is 1.5 - 3.0 PPM and 3.0 - 5.0 PPM for bromine. These are non-chlorine shock treatments that eliminate odors and reduce irritating contaminants for fresh, clear water. Remember because of the high temperatures and heavy bather loads, spas require higher sanitizer levels, as well as heavier oxidizer doses to eliminate bather waste and maintain clear, sparkling water. The ideal pH range for spas is 7.2 to 7.8. Any reading below 7.2 means your water is acidic. To correct this you would add Spa Up. If the pH reading is above 7.8, it means the water is basic or alkaline. To bring the pH level down you would use Spa Down. Another pH balancing product is called pH Balance it works great following some simple instructions included. Once again to achieve these readings, you will need a test kit or test strips. It is also best to get your sanitizer level at a reasonable measure before testing the pH. IMPORTANT NOTE: Before adding any chemicals to adjust your pH levels, the total alkalinity must be balanced first. Sounds confusing? It's not, let us explain. If you thought pH was important, you were right. But, total alkalinity is even more important. The total alkalinity is the buffer of pH, if it is not balanced correctly, the pH will not give you a correct reading. Total alkalinity is the ability to control pH. Think of the pH as the thermometer on your furnace's thermostat. The thermometer measures the exact room temperature. If it's a little cooler than you like, you turn the thermostat up. You have just displayed the ability to control the temperature. 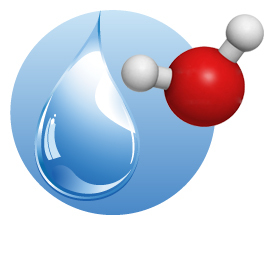 Total alkalinity is like the thermostat, in that it gives you the ability to control pH. This is why you test and adjust the total alkalinity before even touching your pH test kit. Your goal? To keep total alkalinity readings inside the acceptable range of 80 to 120 PPM. If you suspect your pH level to be a little high, then try for a higher reading of 150 PPM when testing the total alkalinity. Why? Because pH-lowering chemicals will lower the total alkalinity as well. If your total alkalinity reading is below 80 PPM, then you will use Spa Up. If you got a reading above 120 PPM, then Spa Down is what you will use. Again, to achieve these readings you will need a test kit or test strips. Now, you ask, what would happen if I didn't keep the total alkalinity balanced? Let's take a quick look at the problems that can result. Sometimes referred to as "total hardness", calcium hardness is a measurement of minerals in your water including calcium and magnesium. You do want your water to have some level of hardness. If the water does not have enough calcium, the water will draw from other minerals, including copper, aluminum and iron, (e.g., heating elements, pump seals, and internal parts on gas fired heaters). This will result in equipment corrosion. If there is too much hardness, you will see scale formation on the spa's interior and the water will take on a cloudy appearance. Because of this, it is recommended that you fill your spa with water from a softener instead of tap water. So what should the calcium reading be? Between 100- 250 PPM's for acrylic finish, and 250-450 PPM's for plaster finish. Let's look at some potential problems if it goes unchecked. If your water is high in calcium there is no known way to lower it using chemicals. Using Spa Defender gives the best preventive maintenance against scale formation. Also, if your water is high in calcium this is where you may want to use water that is treated by a softener to fill your spa. In many cases you will find a low calcium reading that can be adjusted by using Calcium Booster. To make any adjustments to calcium hardness you will need a test kit or test strips. Well that's all! All the really important stuff anyway. There are other chemicals available that will help keep your water clean, clear and free from oily scum. These can be found in the Chemicals section. Remember, test your water regularly, but most of all, enjoy your spa!